We spent a little over 3 weeks in Vietnam, travelling north to south from Hanoi all the way to Ho Chi Minh City. We absolutely loved Vietnam, being so diverse with so much to do, really low prices, friendly people and the most delicious food. Much like when we were travelling in Thailand, Laos and Indonesia it can be tricky to stay completely low FODMAP due to base ingredients used in many dishes, such as onion and garlic, and so challenging yourself with these before visiting would be useful to test your tolerance levels. The great thing however is that most of the main ingredients used are low FODMAP, for example main carbohydrates are rice/rice noodles/rice paper wraps, plus meat or fish and low FODMAP vegetables. The other great aspect of the Vietnamese style of eating is that a lot of it is ‘build your own’ style, which allows you can leave out ingredients that may not be suitable for you or just to have a small amount depending on tolerance levels. There are regional variations and specialities in Vietnam, however the main classic dishes you usually find in Vietnamese restaurants you will find everywhere. There is such a wide variety of breakfast options, from what may be offered at your accommodation to street eats. We tended to always be offered some sort of egg dish which would be suitable, or rice noodles in broth with an egg. Most often the noodles would be suitable except for probable garlic and/or onion in the broth. There were also some interesting street eats we came across, such as ‘banh cuon’ which was rice pancakes stuffed with a small amount of mung bean paste and served with a dipping sauce. The texture was a bit strange but the flavour is good. I have to admit we did rely on ‘banh mi’ a lot, which is a French style baguette with your choice of meat or omelette, vegetables and sauce. These baguettes are cheap and delicious but unfortunately due to the bread, are not low FODMAP. If you are travelling on a budget make sure you test your FODMAP tolerance levels to fructans found in wheat so you can hopefully include a few banh mi during your travels. Low FODMAP fruit is also widely available, such as pineapple, papaya and bananas. We didn’t rely on our porridge as much here as we did in Indonesia for example, as the food was so much more affordable in Vietnam. The juices available are also really nice, we tended to go for a fresh carrot with a small amount of orange added. Blended banana ‘juice’ was also a worldwide favourite of ours. We didn’t do too much snacking in Vietnam as we tended to stick to main meals. The usual fruit, nuts and juices are available everywhere and we found the coffee to be a snack in itself. We also found yogurt to be popular, served with ice as a drink sometimes with fruit or coffee added. If you can tolerate dairy this is a refreshing snack or breakfast. Remember that 2tbsp of yogurt is allowed in the low FODMAP diet restriction phase! Pho: A favourite all throughout the whole of Vietnam. Pho is a broth containing various meat parts (usually beef or chicken), bean sprouts, lime wedges, the essential greens (basil, mint, cilantro/coriander), and whatever chili sauce and fish sauce you need to doctor up the broth to your liking. Some will contain small amounts of onion and garlic, however we generally saw the greens of spring onions used to flavour. We had the best ones in Hanoi. Bun Cha: An absolute favourite of ours. Grilled or barbequed pork patties, served with rice noodles, herbs, pickles and rice paper rolls. Served with a dipping sauce which if too garlicy, you could substitute for a plain chilli or fish sauce which are always available. Goi Cuon (spring rolls): Either available as fresh or fried (although the fresh ones are easier to see what exactly is inside!). Each region has its own speciality, however the most common are filled with prawns or the meat of your choice, plus herbs and rice noodles. Again served with a dipping sauce which if not suitable could be substituted for plain chilli sauce. Banh Xeo: A crispy sizzing pancake made from rice flour, a small amount of coconut milk and turmeric, then filled with beansprouts and either prawns or meat. This again is served with herbs and occasionally wrapped in rice paper. Com Tam (broken rice): A low FODMAP rice and meat dish which is usually served with salad and an egg. Cao Lao: Another noodle dish which is specific to Hoi An. Rice noodles served with a very light broth and topped with pork, herbs, beansprouts and occasionally dough croutons which you could removed. There is so much variety available and meals are easily adaptable, so a great place to eat for the low FODMAP traveller! For more articles on travelling on a low FODMAP diet click here. 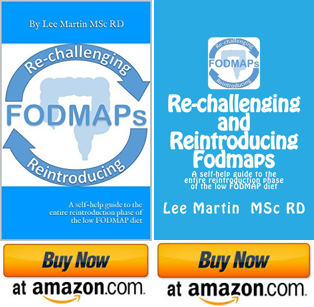 If you are doing the low FODMAP diet and need some help with the reintroduction phase, our ‘Re-Challenging & Reintroducing FODMAPs’ book will guide you through the process step by step. For more information on this click here. *Special offer until October 2016* Do you have questions regarding the low FODMAP diet but don’t feel you need a full consultation? We are currently offering Skype sessions up to one hour from only £25 with an expert dietitian to help put your mind at rest. Please contact us to book a slot or find out more.